Asheville pops up on national rankings for a variety of things: Modern Maturity named it one of “The 50 Most Alive Places To Be,” AmericanStyle magazine called it one of “America’s Top 25 Arts Destinations,” Self magazine labeled it the “Happiest City for Women,” it is one of AARP Magazine’s “Best Places to Reinvent Your Life,” and was proclaimed the “New Freak Capital of the U.S.” by Rolling Stone. Asheville has also been called “a New Age Mecca” by CBS News’ Eye On America, and named the “most vegetarian-friendly” small city in America by PETA. In the 2008 book The Geography of Bliss, by Eric Weiner, Asheville was cited by the author to be one of the happiest places in the United States. In 2007, Asheville was named one of the top seven places to live in the U.S. by Frommer’s Cities Ranked and Rated, #23 of 200 metro areas for business and careers by Forbes, and the best place to live in the country by Relocate-America. It was also named one of the world’s top 12 must-see destinations for 2007 by Frommer’s travel guides. Asheville and the surrounding mountains are also popular in the autumn when fall foliage peaks in October. 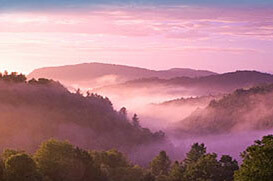 The scenic Blue Ridge Parkway runs through the Asheville area and near the Biltmore Estate. Downtown Asheville is a major attraction for tourists in the area. Mayor Terry Bellamy (the city’s first African-American female mayor) is a member of the Mayors Against Illegal Guns Coalition, a bi-partisan group with a stated goal of “making the public safer by getting illegal guns off the streets.” The Coalition is co-chaired by Boston Mayor Thomas Menino and New York City Mayor Michael Bloomberg. In 2005, Mayor Charles Worley signed the U.S. Conference of Mayors Mayors Climate Protection Agreement, and in 2006 the City Council created the Sustainable Advisory Committee on Energy and the Environment. In 2007 Council became the first city on the East Coast to commit to building all municipal buildings to Gold Leed Standards and to achieve 80% energy reduction of 2001 standards by 2040. In 2007 signed an agreement with Warren Wilson College stating the intent of the city and college to work together toward climate partnership goals.